Driver's door is unlocked if the unlock button is pressed once. The hazard warning lights will blink twice to indicate that the driver's door is unlocked. All doors are unlocked if the unlock button is pressed twice within 4 seconds. The hazard warning lights will blink twice again to indicate that all doors are unlocked. If no doors are opened within 30 seconds after unlocking them, the doors will automatically lock again. 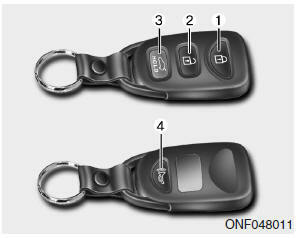 The unlock mode is changed alternately by pressing the lock button and unlock button on the transmitter at the same time for 5 seconds or more. The hazard warning lights will blink four times to indicate that the mode conversion is completed.